Hamilton Masakadza farmed the strike and found his groove in the first 14 balls. However, he tossed it away with a mistake a player of his experience should not have made. After pushing a Tanwir Afzal offering to mid-off, Hamilton casually took off for a single. Babar Hayat, however, swooped down on the ball and hit the stumps at the striker's end. Masakadza had most of his body in the crease, but had not ground his bat, and his front foot was in the air when the stumps were broken. Hong Kong mustered half an appeal, after which umpire Aleem Dar sent it upstairs. Replays showed that Hamilton had made an amateur mistake. The Zimbabwe captain hung his head on his bat in disappointment, knowing a sprightly start was squandered. 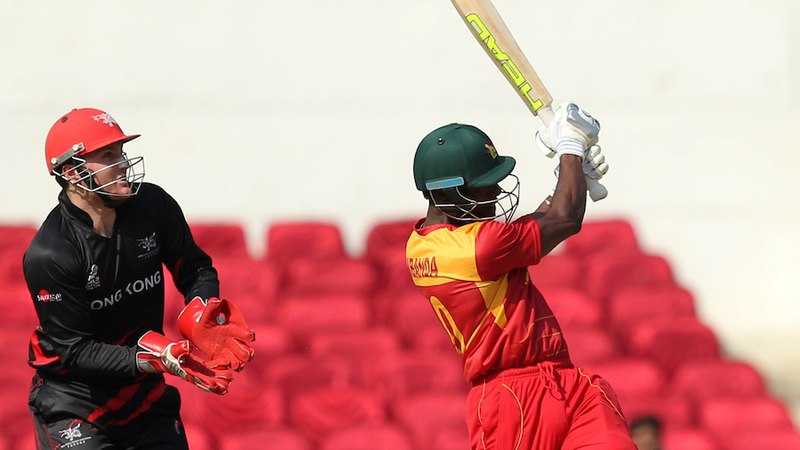 Vusi Sibanda only brought out the shot that has often caused his downfall - the pull - once in the first 40 balls he faced as he focused on building an innings after Zimbabwe's early losses. He flirted with the sweep, but then abandoned it in favour of muscle as he approached his maiden T20I half-century. He brought up the milestone off 40 balls when he skipped out and slammed left-arm spinner Nadeem Ahmed straight down the ground. His previous-best effort was 49. After his first run-out, Hayat had a fairly easy task to lob the ball in to Ryan Campbell and run Sikandar Raza out, before he found himself called on again at the death. Elton Chigumbura was desperate to keep the strike in the last over, and when he sent the ball to long-on, he called for two even though it meant chancing Hayat's arm again. Wellington Masakadza was always going to struggle and Hayat caught him well short to cap a productive day in the field. Sibanda would have thought it was his day after his success with the bat, but he was brought down to earth in the chase. Jamie Atkinson made up his mind to target Wellington Masakadza early on and went low to sweep the second ball he faced. Atkinson hit it flat over midwicket, but not long enough. Sibanda overran the ball and attempted the catch with only one hand, but the ball burst through to the boundary. Fielding used to be one of Zimbabwe's strongest suits, but nerves seemed to get the better of them in key moments in the tournament opener. Wellington was guilty of the gaffe of the day when Mark Chapman drilled a Sikandar Raza ball to long-on. Wellington had to make some ground to stop it. He got there, but ended up letting the ball through his fingers for four. Raza was irritated with the clumsy effort and Wellington could only apologise in embarrassment. Filthy full tosses are not often the cause for celebration, but when Mark Chapman was caught off one, Zimbabwe's biggest supporter was on his feet. Chapman slogged Raza to deep midwicket where Sibanda, who had dropped one earlier, made no mistake. He took a good running catch with both hands and his effort was most appreciated by Zimbabwe's new bowling coach Makhaya Ntini. The former South African quick was on his feet, applauding and grinning. Features The start of a billion-dollar event, really?